After three years of hard labor, we, at HfS, are proud to launch our first "HfS Blueprint" that we believe is the revolutionary crowdsourced methodology for evaluating business and IT service providers. The industry has been literally screaming at us to change the way analyst firms portray their assessments of service provider performance, and we've dug deep to leverage our massive community, our extensive buyer relationships and demand data, to facilitate what we truly believe is a major game-changer in the research analyst industry: The HfS Blueprint. Finally: A customizable assessment tool where enterprise buyers can re-calibrate the weightings to assess their provider-fit based on their own unique needs. 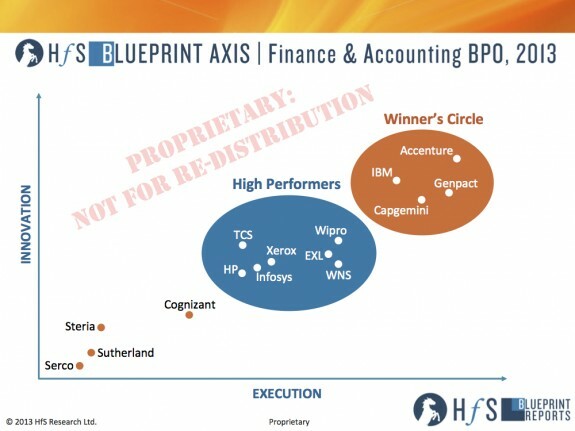 We are happy to discuss the Blueprint methodology in greater detail (drop us a note here) but essentially, in this example for F&A BPO, we assessed data from 745 live multi-process F&A BPO engagements to ascertain provider market shares, depth of client base, breath of execution and geographic scope of delivery. We then conducted exhaustive interviews with multiple buyers and market advisors to help score providers against each other across all the sub-categories of the Blueprint using ExpertChoice, an advanced statistical analytics platform. We also received a tremendous amount of cooperation from (almost) all of the providers above, as we went through this exhaustive process to understand their concrete plans for the future, get really deep with their current client relationships, their overall vision and their appetite to evolve into higher-value areas of F&A BPO. Congratulations to the Winners Circle and the chasing pack of High Performers... we'll see how the picture has shifted in 2014! Thanks to all who took part - you've helped create a little bit if research history. You can download the full HfS Blueprint methodology by clicking here. Excellent work - this should "send the cat among the pigeons"! Another cause to celebrate the efforts and success of HfS. I am excited to see the Blueprint help change the behavior of providers and how they use analysts to promote themselves. I applaud this attempt to inject some realism into the analyst industry. Being able to cultivate the views and opinions of the broader industry, and not simply the bias of a solitary analyst, is a real game-changer. This looks really ground-breaking - I am very impressed. Can you elaborate on how the execution and innovation scores breakdown? @Eric - The methodology is in the download. Each factor is broken down into weights, and those weights are part of the published Blueprint (available to clients). The weights change from category to category based on the inputs from the buyer community. The weights and scores are customizable for clients, so they can run their own model based on their specific needs - or compare how their results compare to the broader community perspective. Thanks for sharing this blog. This is looks really ground-breaking . I'm very impressed. This is great move. Can't wait to look at the first report. All the best ! @Eric - to add to Tony's points here, the Blueprint shifts the "power" away from the analyst or analyst firm and onto the broader community, where the buyers, influencers and providers assess what criteria are more important for said category (in this case F&A BPO) and the providers are paired off against each other within each category, based on evidence from exhaustive customer interviews, expert interactions and finally the provider's own vision and investments. I love the fact that you are crowdsourcing the evaluations and steering clear of these dubious methodologies I am so tired of seeing. The sourcing world needs this! Really looking forward to finding out more and seeing how this evolves. this is amaazing work phil.. hats off to the team.. Pls explain how execution and innovation are measured.. This looks impressive and highly insightful...look forward to seeing such analysis for this industry.